The fascinating tour will see you travel to the land of the Vikings, be in awe at the fjords and be mesmerised by the Northern lights. You will see the delights of Denmark, Norway and Sweden including the birthplace of Haans Christian Anderson, Vigeland Sculpture Park and Lillehammer; host to the 1994 Winter Olympics. Choose from many optional experiences to suit your budget and create your own memories. Welcome to Copenhagen. Relax and unwind after check-in or take a stroll through the city. Tonight meet your Travel Director and fellow travellers for dinner at the hotel. This morning, your Local Specialist takes you on a sightseeing tour of this wonderful city, including the major sights such as the Little Mermaid, Nyhavn, the Royal Amalienborg Palace and the Carlsberg Glyptotek. You’ll have free time to visit one of the galleries or do some shopping. Enjoy the quaint scenery of the Danish Riviera’s conservation heritage route, as you pass through ancient fishing villages and modern marinas. We’ll also view Fredensborg Palace, summer residence of the Royal family, before continuing to the magnificent 17th century Frederiksborg Castle, where you’ll see the State Apartments and the Coronation Chapel. This evening we’ll visit the fairy-tale village of Dragor, with its thatched cottages and pretty working harbour. You’ll wander by tiny houses, learn a little of the history and enjoy a taste of traditional Danish specialties. Then, enjoy an hour-long cruise along the canals and experience stunning views of the city from the harbour. This morning cross the Great Belt Bridge to Funen. Stop in Odense, Hans Christian Andersen’s birthplace. 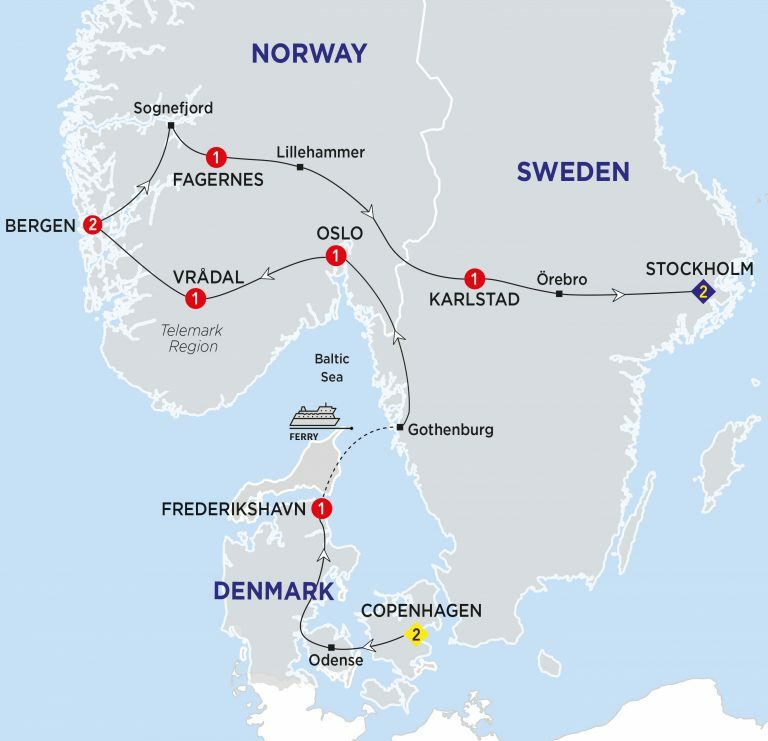 Later continue north through Jutland and spend the night in Frederikshavn. Leave Denmark this morning as you board your ferry across the Kattegat Strait to Gothenburg in Sweden. A scenic coastal drive leads you to Norway where you will spend the night in the capital city of Oslo. This morning your Local Specialist will show you the highlights of Oslo including views of the medieval fortress Akershus, the Town Hall and the Royal Palace. Visit Vigeland Sculpture Park where you will find the world’s largest sculpture exhibition made by a single artist. This afternoon start exploring the impressive Norwegian countryside as you travel towards the Telemark region, famed for being the home of the original and oldest skiing technique. Tonight enjoy dinner at your hotel. You’ll visit the three original Viking longships and their treasures with your Local Specialist, including the Oseberg ship – last used as a burial ship for a woman of high rank. Then explore the stunning Fram Museum to discover the story of the ship and the race to the South Pole, illustrated with films, images and new exhibits. Start your day with a spectacular drive that takes you through the mountains and around the Hardangerfjord. Arrive in Bergen, Norway’s second-biggest city famed for its shipping, aquaculture and subsea technology industry. Today experience the history of this picturesque city on your orientation tour. See the 13th century Haakon’s Hall and the bustling fish market. You’ll have free time to explore the harbour area and the UNESCO World Heritage-listed Bryggen which is the old wharf of the city. We’ll head out along the fjord to visit the home of famous composer Grieg, where you’ll enjoy a guided tour of the villa – the inspiration for many of his masterworks. You’ll also explore Bergen on a walk through the historical lanes, and see stunning views of the city on a trip up the hillside by funicular railway. Come with us as we explore the lost village of Televag, destroyed when the Gestapo discovered the villagers’ support of the resistance. You’ll visit the museum before we journey to a traditional Norwegian fishing village for coffee and local pancakes. Certain departures also include a guided visit of Fjell Fortress, a Nazi command bunker hidden deep inside the mountain. This morning after breakfast travel inland to Fagernes. Admire the spectacular Sognefjord, the largest and most well-known fjord in the country. Dinner this evening will be at your hotel. Enjoy a relaxing cruise along the UNESCO-listed Næroy Fjord with it’s towering mountains and fabulous scenery. This stunning fjord landscape with waterfalls, snow capped mountains and tiny villages has inspired painters for hundreds of years. Travel to Lillehammer, host of the Winter Olympics in 1994. The scenery will change as you drive through lush forests along gorgeous lakes towards Sweden. Spend the night on the shores of the biggest lake of them all, Lake Vänern in Karlstad. This morning visit Örebro, a lively university town. View the castle dominating the town centre before continuing to Stockholm. Marvel at the opulent interior of the world-renowned City Hall, where the Nobel Prize banquet is held every December. Then enjoy a most traditional Swedish refreshment, a ‘ fika’, in a local cafe. Discover beauty and history combined during a walk in the fairy tale Gamla Stan, where little has changed since the 16th and 17th centuries. Then enjoy delicious Swedish cuisine in a popular local restaurant, with a drink included. Today get to know this beautiful city on your sightseeing tour with a Local Specialist. View the medieval Storkyrkan, the Town Hall, Riddarholm Church and the Royal Palace. Spend time discovering the museums or fashionable stores or consider an Optional Experience in the afternoon. Tonight dine with your fellow travellers and celebrate this memorable trip. Enjoy the beauty of Lake Malaren with your Local Specialist, as we sail in an antique steamboat through the archipelago, past country cottages and elegant homes. You’ll also visit the royal warship ‘Vasa’, an ornate 17th-century galleon which sank just minutes after sailing, now reclaimed from the Baltic. Savour a drink in a glass made of ice in the minus temperatures of the Ice-Bar, made completely from the frozen waters of Sweden’s River Torne. You’ll also discover the very best views over the city and its archipelago, with a visit to the viewing platform of the Kaknas Tower, Sweden’s highest building. Say goodbye to Scandinavia as your holiday draws to a close. Airport transfers are available. Conditions apply.